However long I live in Germany, it seems that people spot me for a foreigner the moment I open my mouth. The problem is that I speak a fairly accent-neutral grammatically correct German. Stop sniggering at the back there! This of course, is a dead give away. Real Germans just don’t talk like this. The trick is to find something other than Hochdeutsch to have as your accent. This blog already suggested that famous dialect: Imbißdeutsch as a way of passing off as a local. To complement this, I’d like to suggest another form of German which will allow us to blend in – this time with a group which we really wouldn’t want to spot us as being foreign. The neo nazis. I’m worried about my daughter’s cat. 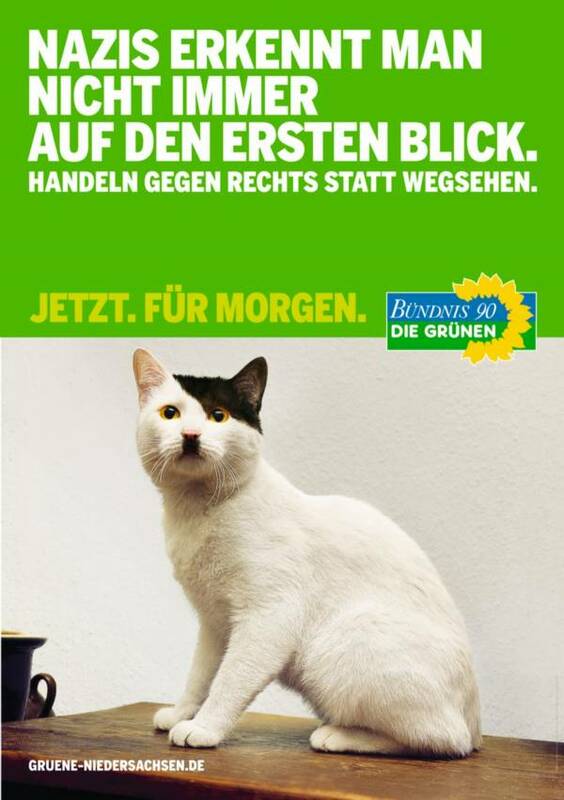 Here in Germany the Green Party is running a set of posters alerting people to the risk of a new rise in neo-nazism. The posters look like this. Well of course I thought nothing of it when I saw the posters, other than admiring a nice bit of photo-shop manipulation. I thought the image was meant to be allegorical. And anyway, nobody living around our neighbourhood looks remotely like a neo-nazi. In fact most of them don’t look like a neo anything. 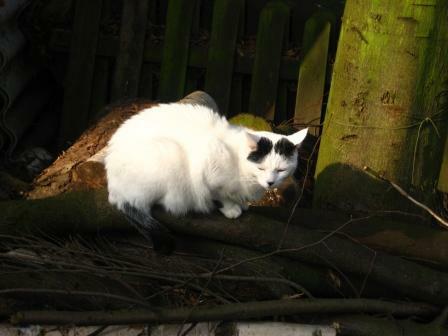 But then I arrived home and spotted my daughter’s white cat out patrolling the garden. I couldn’t have been more shocked if I’d been struck on the head by a falling paint bucket! Here’s the chilling sight that greeted me! It was all there! The hair, the moustache. The way he was walking along the fence with a clear plan to invade and annex next door’s garden. The tendency to bully small rodents in the garden. The small furry or feathery corpses on the doormat in the mornings. There could no longer be any doubt. My worst nightmare was realised. By day, he’s undercover as a lazy fluffy feline who spends 12 hours at a stretch sprawled on top of the radiator next to my desk. By night he’s engaged as a right wing activist in an illegal feline organisation. He’s a turncoat, a traitor, a lickspittle and a cad. My daughter’s cat is a nazi!